So today I received the best lil toy anyone pregnant woman can ask for! You know my last post I stated that I ordered a rental fetal heart doppler. Well I got an email the next day of me ordering it and they were so generous and said "instead of sending it to you standard mail which was no charge we are going to send it to you 2day FedEx no charge." This website ROCKS www.bellybeats.com. So as I sat on my toilet (TMI) I heard the FedEx truck and ran to the window to see if the FedEx guy was coming to my door and sure enough it was for me :) I ran back upstairs (yes I finished using the restroom LOL) and as I was talking to my sister on the phone I hurried and opened it up and placed the COLD jelly on my belly and heard my baby girls beautiful heartbeating... Since this one isn't a digital one as my sister counted 10 seconds I counted baby girls heartbeat and you are to times 6 by the counts of the heartbeat. It was around 150 bpm. If anyone is interested in renting one go to www.bellybeats.com, and when you get to a place that says Referral Code put ROD4257. Also I got a 15% disc as well by reading my email from them first then ordering it. Have a great weekend in the Lord!!! Comments fixed, update on Midwife/Dr., Fetal Doppler-RENTED! So today I went ahead and rented a Fetal Doppler from BellyBeats online. I was a little scared about renting one but I want to be able to hear Elanie's heartbeat before I go to sleep or whenever I want. Stay with my Midwife or a Doctor?? I think I will follow up with Dr. M! He seemed more concerned which I like better.. I mean if im "high risk" shouldn't they be doing more? 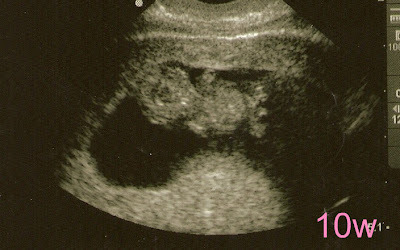 Here are my ultrasound pics starting from Week 5 till now Week 20... Enjoy! 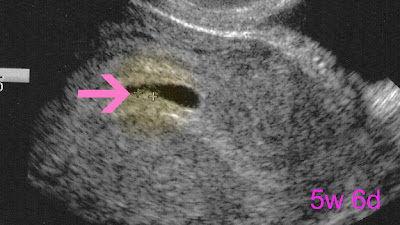 This ultrasound was taken on my first OB appt with my midwife. Since I took Clomid she wanted to make sure there was a baby. As I held my hubby's hand *tight* all we saw was a little flicker of her heartbeat which was about 90 bpm. This is from my 10w appt. All went well and at first we thought we saw boy parts but dr said it is the umbilical cord. This one is my 13w OB appt. 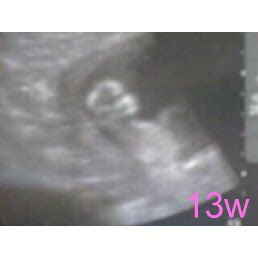 And if you click here you can see the u/s pics from my Level II ultrasound at 20 weeks.